3M, the maker of the iconic Scotch brand of adhesive backed tapes is introducing a new green version of its “invisible tape. 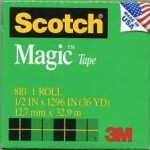 Scotch Magic Invisible Tape will now be offered in a version made of 75% recycled or renewable material and it will come in a refillable dispenser. 3M’s new version of this familiar product uses a plant-based adhesive and will be stronger than the original version of the product. Click here for more information from 3M. Allabouttape.com is your source for information about the adhesive tape industry. All the news about gaffers tape, safety tapes, duct tape, vinyl tapes and new developments in tape technology.